"I want to get a tattoo." I was 16 and probably shouldn't have been making lifetime decisions quite yet, but loved the permanence and significance a tattoo holds. Lucky for my conservative father and easy-going-but-still-draws-her-lines mother, my perfectionist attitude was with me long before I became a designer so I didn't rush to the nearest parlor. I had no idea what, where, how big, or how visible, but I planned to get one someday. 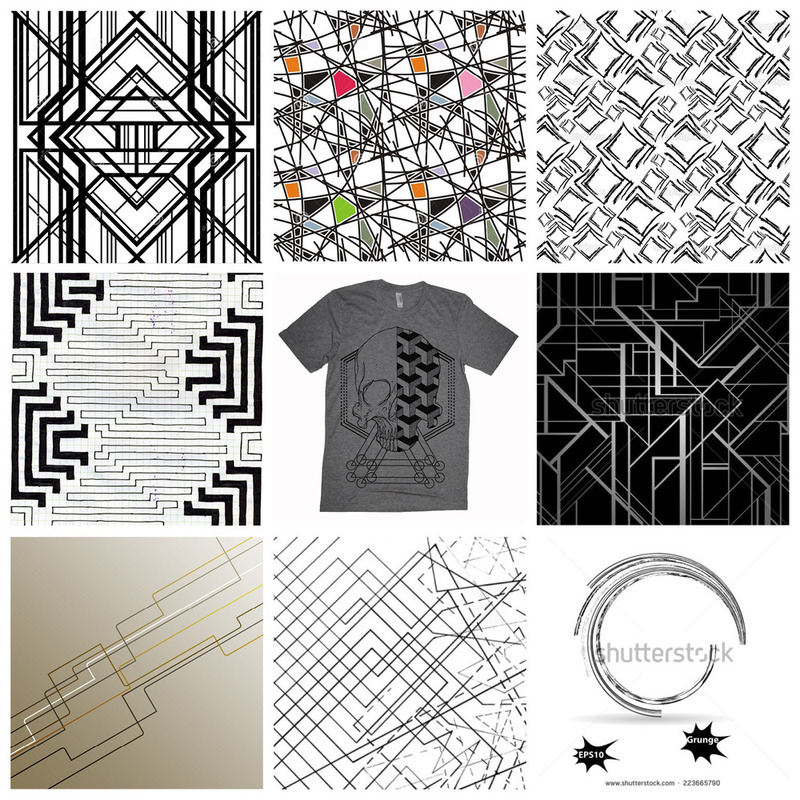 A sample of the inspirational patterns and artwork I collected 2013–2014. 1) It would reflect the importance of family. 2) I would be able to see it. 3) I didn't care if other people saw it. And 4) No color—simple was the way to go. During my senior year of college, I was a student in Molly Morin's class "Emerging Formats for Digital Arts." The two sides of my conflicted brain had finally found a home—the convergence of art and engineering. We transformed facts that were once words or numbers into an interesting visual representation. Whether we like it or not, instant access to a seemingly unlimited amount of information is more available everyday. When presented through visually interesting and informative designs, pertinent data can be quickly identified and understood in a meaningful way. The approach to art and design I learned in Molly's class would be the one I used to design my tattoo. Armbands whose location, line weight contrast and simplicity I wanted to create in my design. By mid 2014, due to its visibility but dual-functionality as a permanent piece of jewelry, I settled on an armband and began to work on different ways to represent my family. I recorded the birth year, month and day of my two siblings, parents, mother's parents, and father's deceased parents. While I explored many options, below is the process for the final result. Click each image for a closer look. Step 1: Set up grid using circumference of arm to represent one year and divide into 12 sections for each month. Divide desire height of tattoo by 61 (the amount of years between myself and my oldest relative). Step 2: Add one line of equal length for each person. My siblings and mom's parents were born in the same year and share a thicker line. Step 4: Position each line so it begins at each person's birthday. For years with more than one birthday, slide the line to the first birthday. The mark for the second birthday does not move with the line. Step 5: Scale down the entire piece so the overall length is the circumference of my arm. Step 6: Thicken strokes and proportionately shift lines vertically to avoid future bleeding. add caps at the end of lines for those who have passed. Add breaks to represent multiple births in one year. The final result. Photo cred to Drew H. who also provided hours of moral support. Tattoo artist Dave Norton of Pino Bros Ink made a few additional tweaks to allow for a successful session and the tattoo's longevity. Since college, I have looked through what has to be hundreds of tattoo artists' portfolios. When I discovered Dave's absurdly straight lines and geometric style, I called the very next day to schedule a consultation. In mid-December of 2014, Dave inked some of the straightest lines I've ever seen and 8 years in the making became a reality. Now living 900 miles away from my family, it's kind of nice having them right there on my arm.